I, like many other veterans, have been asked "what do you remember about THE WAR"? The "I" in the title is important. This is a combination of what I remember and my personal review of authoritative histories. It is the story of one battalion in one specific division. Remember, hind sight is 20/20; long after an experience, that experience may seem quite different. Today, the short answer to the question "What do you remember?" is: "Cold and fear!". Had you asked that in 1946 as I was discharged I more likely would have answered "Tired and glad to be home!" As I said, this is the story of what I remember. You must realize I was a private in the 303rd Combat Engineer Battalion of the 78th Infantry Div. What I will give you is a snail's eye view of what occurred. Why a snail? Well, a private, like a snail, is at the bottom of things and a private, like a snail, moves slowly within the larger world. And neither have the foggiest idea of what is really happening in that larger world. This is why I also turned to some histories and not just my memories. As my story begins, "The WAR" was going very well for the allies. We in our division felt very good that we had missed the worst. And we had; we had missed the landing on D-Day. In our minds, as engineers in the lead clearing mines and obstacles, nothing could be worse than a landing. D-Day for the 78th Div was Dec 13. As we entered the line the Germans had been pushed back to a reasonably straight line along the Siegfried Line. The Roer River was just behind it and served as an effective barrier. While it was not a large river, it had steep banks as most rivers of the area had. Further, it had a sizeable dam still under the control of the Germans. If blown while the allied troops were crossing the river, it would create a flood and devastate the forces. Efforts to bomb and destroy the dam had failed. The bridge over the dam was gone but the dam itself was still intact. 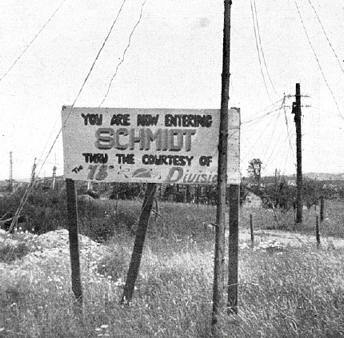 The division orders were to take the town of Schmidt and secure the dam. This meant breaching the Siegfried Line - pill boxes and dragons teeth. Intelligence reports said that despite the fortifications there was no significant German strength in the area - the Germans were on the run. This was to be a mission to acclimate us to the sounds and feel of enemy fire. Well, there was great resistance! Casualties were very high; in the order of 1500 KIA and MIA. The division was not totally successful, they did not take the town and dam. They did advance the line; break through the Siegfried Line and take and hold several towns of eventual importance to the advance. On December 16, 1944 the Germans attacked through the Ardennes. This eventually became known as the Bulge. Because of this attack, the eventual bulge and the obvious strength which materialized in the area, I have always wondered how honest the appraisal of the situation was that had been given the 78th. But at the time I had no occasion to question it. I have done considerable reading on the topic; without going into great detail a few points are of interest. Hitler had decided some time before this date that an attack through this region, driving across the Meuse River and on to Amsterdam would split the allies - both physically and politically. Hitler had new codes developed just for this operation and the attack was a secret within the German Army as well as within Germany. Troop movements were with great subterfuge. British intelligence had picked up messages and had broken the code but neither they, nor the allied commanders, put any credence on the findings. US Commanders thought the attack was just an isolated retaliation for the 78th attack. As the attack went on and developed into the Bulge, they, including Eisenhower, thought it was a drive to retake Paris. Hitler's order was the grand scheme; his generals had lesser hopes. The German generals on the scene were reacting under extreme demands for time and success which caused them to ignore some lesser but very important battlefield requirements. My studies make it apparent to me that what the division was told was what the higher echelons believed but their belief was not an accurate or proper analysis of the situation. Intelligence had failed. The 78th, in their striving for the dam, was sitting just north of the German attack . During the Bulge the role of the 78th became a defensive one. The division was ordered to stop its attack but hold its position; the engineers role became one of laying mines, stringing concertina and setting booby traps instead of clearing them. As it turned out, the Germans had no interest in taking the land we held; their goal was to encircle the entire US Ninth and British Armies. The infantry dug in along the front and the engineers set up defensive barriers. The Germans were dug in along the crest with our troops at the base of the hill behind a tiny stream; not more than one klick across. The holding action meant mines, more than I had ever imagined. As engineers, we were laying mines in that land in between. Both the friendly and enemy troops were clearly visible. Sometimes we had to relay them when we found them disturbed. On one occasion a US bomber crash landed through one of our mine fields dragging many behind it but the crew got out. Day and night we worked in shifts digging in mines - mostly anti-tank mines. It was cold; the ground was frozen; and it began to snow. I think the records show it to have been one of the worst European winters. At first we carried our rifles slung over our shoulders but this was cumbersome when digging in mines. We soon left them in the truck; after all, the infantry was there. Our task was further eased by the snow as there was no need to dig the mines in to hide them; the snow did this for us in a very effective manner. When not laying mines we were assigned the job of destroying the Siegfried line. This meant blowing the pill boxes. We did little to destroy the dragon's teeth; generally they were not an obstruction once we had by-passed them. In the 1970's I had the opportunity to visit the area and found the dragon's teeth still there; I did not walk in to look for any of the pill boxes. I was not sure that all of the German and American mines had been cleared. At that time I also drove over the dam and found it unrecognizable. It had been rebuilt as a much higher dam creating a significantly larger lake. Life for the engineer was generally more comfortable than that of the infantry. Each squad had a truck and trailer for its tools and supplies. We also managed to squeeze a case or two of rations onboard (K, C, D, canned milk, coffee whatever we could pilfer). Among our engineer tools were several blow torches which effectively heated canteen cups so we had hot food and drink - in my case hot chocolate. We usually commandeered a house to go to when not busy at the front. For most of the time that we held the northern flank of the Bulge our platoon lived in a very modern one; which, surprisingly, had sporadic electric and water service presumably from the dam in German hands. It was also just out of range of the German 88s. Regular shellings landed a few hundred feet short. We did have to move our slit trench. This also meant that most nights we came back to the field kitchen and hot food. By mid-January the German offensive was essentially neutralized. US drives were being made from all sides. The 78th continued the attack they had started on Dec 13. The cold broke on Feb 4 and a thaw set in. Our engineer task became one of road maintenance and keeping dirt forest trails passable - cutting trees for corduroy road and hauling gravel. After much heavy fighting, Schmidt was taken on Feb 8. 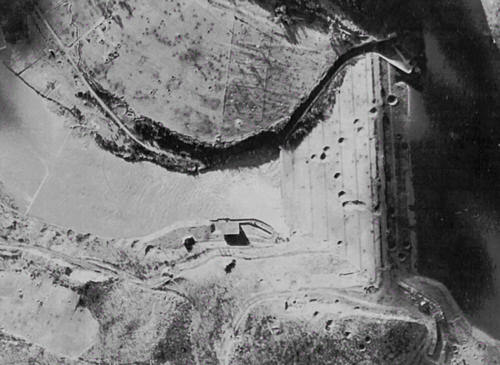 On the night of the 9th a special 303rd CEB team of five engineers and protecting riflemen inspected the dam for explosives but none were found. The penstock gates had been blown releasing a 23 foot diameter column of water producing a temporary flood. The dam was reported secure on Feb 10th. The flood peaked on 25 Feb. After 59 days (Dec 13 to Feb 10th), we were across the Roer. The statistics in Table 1 summarize the extent of the activity for the 78th Division. * 35 square miles of Siegfried defense cleared. * 16 towns and 2700 prisoners taken. * 159,000 lbs of TNT used. * 28,400 anti-tank mines laid. * 3,500 anti-personnel mines set. * 2,000 miles of phone wire strung. The 78th Infantry Division was present at the very beginning of the Bulge and, while participating mostly in a holding roll during the Bulge, essentially ended the Bulge with the capture of the Roer dams and the breakout onto the Cologne plains. Up to here I have talked about our Division and its holding action in the Bulge. A review of what I believe to be some of the controlling factors through out the Bulge seems in order. Hitler had misjudged many things when he planned the Ardennes attack. In particular the morale of the German soldier and of the US soldier. Ammo availability was poor on both sides but the US had new artillery rounds and more artillery pieces despite their loosing some. Gasoline supply for the Germans became critical. Hitler had counted on capturing US supplies; it essentially never happened. Communications was extremely poor on both sides. For the US and allies radios were constantly out. Maybe some of the radio problem was the terrain; the terrain did not permit line-of-sight radio transmission. Phone line installation was usually strung along fences and trees where it was easily broken. Mobility was very poor on both sides. The nature of the terrain and the weather were the big factors. A usable road net just did not exist. Main roads were almost non-existent; the existing roads were narrow and winding. Forest roads were dirt trails. Snow and cold produced frozen soil which supported some heavy traffic. Bridges were generally too weak for heavy military traffic and many were destroyed in delaying actions. The road net was ideal for road blocks which proved to be very effective slowing the German advance. German command discipline broke down. Under the demand for speed, they were more concerned with achieving their personal assignments and goals than the overall strategy. They did not use assigned roads and created huge traffic jams for themselves. US had no alternatives and attempted the frozen trails with some success. They got some vehicles out, destroyed and abandoned others. Many troops made it out on foot despite the very bad weather. In summary it seems Hitler's last effort was one that was doomed to failure from the start. Unfortunately, it was one that was costly in terms of lives and gained Hitler only a very brief respite. Most of his top command were against it and their hearts were not in the effort; morale was bad even at that level.